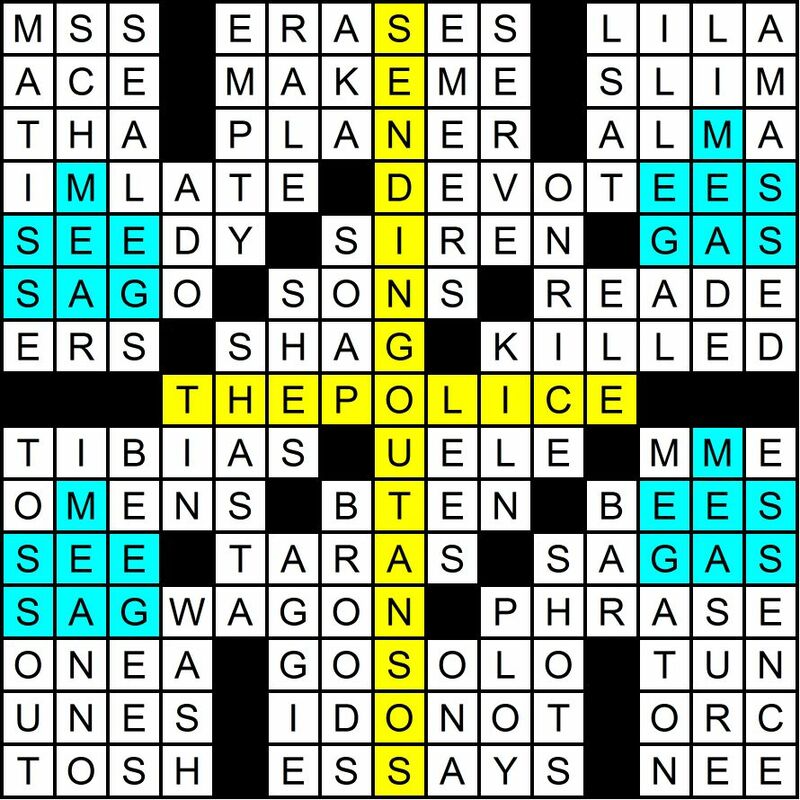 A record 234 solvers found the answer to this month’s puzzle, the 1979 Police hit “Message in a Bottle.” Most people found the puzzle harder than last month’s, but the meta pretty easy. THE POLICE was the central Across entry, and the chorus SENDING OUT AN SOS ran Down. In addition, there were four “bottles” in each corner of the grid containing the word MESSAGE. The title was “Help!” and the clue for GO SOLO mentioned Sting, who fronted the band until he left for a big solo career. 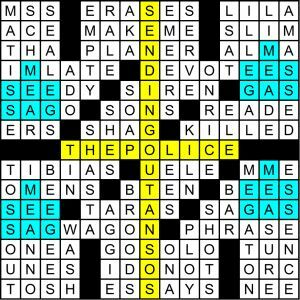 Lots of people sent in suggestions for grid entries that could have been clued musically. My favorite came from Dave Taube who suggested [Upside down flower pots?] for DEVOTEES (DEVO TEES). Second place to Ken Lauterbach who pointed out the Buggles’ song “Video KILLED the Radio Star.” Third to Francis Heaney and Jay Hirt for SIREN, Roxy Music’s 5th album. Honorable mentions for Mumford and SONS (Paula G and Norm Hurlbut), ACE of Bass (Aaron B and Matt G), Bob Dylan’s “You Gotta SERVE Somebody “(Jeffrey K), and LEES as [Peggy and Brenda] (Len Elliott). Aaron also mentioned “Twin SONS” of Different Mothers,” a Dan Fogelberg/Tim Weisberg album I remember overplaying as a kid. Some of you really like the song: This was one of my favorite songs at the time (and still is!) wrote David Poole. Some of you don’t: I can’t listen to that song because they repeat that “sending out an SOS” line sixty bazillion times, and it drives me freaking nuts! wrote Pancho Harrison. (It’s 24 times actually). And a few confessed to never having heard it. A number of solvers pointed out that the highest the song got on the pop charts was #74 in the US (it was a bigger hit in Britain). The randomly chosen winner of an MMMM coffee mug is the lucky Tyler Hinman (also a 5-time winner of the ACPT). There were some pretty fast self-reported solving times this month, since you didn’t need to finish the puzzle to get the meta. Jangler got it in 20 seconds (! ), Francis Heaney in 40 seconds (! ), Arnold Reich in 1 minute, Aerion in 1:50, and David P in 2:50. A number of people had not heard of Duane READE drugstores, which are mostly in New York. I will try to avoid regional entries in the future. Thanks again for the great comments and feedback and see you next month. Puzzle 3 is up on July 3.